It’s been more than a decade since the 40th President to the United States, Ronald Reagan, passed from this life but I clearly remember the days our nation, world leaders, and precious loved ones remembered him, honored him, and said their goodbyes. Among those who spoke tributes to him at his burial service were his children; Michael, Patti and Ron — his special ones who knew him in the private places away from the public eye. Their words touched my heart that day and they continue to challenge me even now as I recall them. History will record his worth as a leader. We here have long since measured his worth as a man. Honest, compassionate, graceful, brave. He was the most plainly decent man you could ever hope to meet. He used to say, a gentleman always does the kind thing. And he was a gentleman in the truest sense of the word ~ a gentle man. Big as he was, he never tried to make anyone feel small. Powerful as he became he never took advantage of those who were weaker. Strength, he believed, was never more admirable than when it was applied with restraint. Shopkeeper, doorman, king or queen, it made no difference – dad treated everyone with the same unfailing courtesy. ~ Ron Reagan Jr.
His children would go on that day to recount his love for his family, his devotion to Jesus Christ and his insistence even in the most difficult years of his Alzheimer’s disease, that those around him be treated with courtesy and kindness. For this man of God who had spent his life growing in grace and offering it to others without hesitation, even when he could not recognize the faces before him and his mind could not comprehend the simplest of things, his heart knew what to do. Even as his life on earth was coming to an end, he was the perfect example of what happens when grace becomes instinct. Oh, how our world needs this today. Oh, how I need this today. In other words, as I experience and come to an understanding of God’s grace — His blessings, His undeserved favor, His love, His kindness, His compassion – my love for God cannot be contained and His grace overflows from my heart onto others. The more I practice this overflowing of grace onto others, the more grace becomes natural – the more grace becomes instinct. How can I practice overflowing grace onto others so that it becomes so automatic that my heart knows what to do — even when my mind may not remember? Show concern — lean in, make eye contact, be present in the moment, give your undivided attention and ask open-ended questions that will help you understand the heart of the one who is sharing. The more you love like Jesus, the more you will serve – the more you serve, the more you will love like Jesus. No act of service is too small. Bake cookies, do the dishes, teach a class, offer to babysit, mow someone’s lawn, open the door, take someone shopping, send an encouraging note, buy someone’s coffee, pick up trash, smile at people in the store, help carry groceries, sew a quilt, help your church with their website – you get the picture. Do you see a need? Whatever you are able to do to meet that need – do it! Jesus willingly gave everything he had. If I want to be like him, I have to have a willingly giving heart, as well. Consider giving of your finances, your time, your expertise, your talent — your stuff. He offers us great gifts for the purpose of sharing them with others, no matter what they are. If you have anything, you have enough to give something. Remember, whatever you offer to others, whether big or small — in the end the one most greatly blessed will be you! Being hospitable means more than sharing meals or beds for overnight stays; it’s an attitude of making room, drawing close, and including others into your life. Try practicing the outpouring of grace by welcoming others into your conversations, always having an extra spot at the table, inviting others to join you & your group for coffee or lunch or an art class, sharing bible study … or sharing your chocolate bar. Value others — draw them to yourself — draw them to Jesus. God loves a heart of thankfulness. He wants us to recognize our blessings, be thankful for them and express our gratefulness to him through our praise. I believe it gives him joy to pour grace on us when we are grateful for those blessings – I know it gives me joy to pour blessings on others when they express their gratefulness for my service to them. Expressing gratefulness is easy — try starting a gratefulness journal and writing down 5 blessings each day, writing a prayer or a song of praise, writing a note of thanks to someone who has served you, giving a thank-you gift, sending a text message, or blasting it on social media. Make it a habit to say a warm ‘thank you’ to people you encounter throughout your day (shopkeepers, bus drivers, waiters/waitresses, doctors, nurses, police officers, firemen, teachers, spouses, children, etc.) — then watch the smiles appear. Consider the feelings, opinions, and hearts of those around you – show courtesy, care, and honor to ones dearly loved by God. Do “Random Acts of Kindness”, grieve with those who grieve and smile at those that cross your path. Not letting unwholesome talk come out of our mouths isn’t just about cursing or crude words (though I believe that would be included in this exhortation), it’s about pouring grace on others with our words so that they benefit the hearer rather than ourselves. It’s about intentionally choosing words that do good rather than harm, that heal rather than hurt, that build up rather than tear down, that empower rather than discourage — that add to rather than take away. And – do you see what follows? Do you see what happens when we DO let ugly words overflow? Oh, dear ones — when we let hurtful words come from our mouth; when we harm those that God loves — we also grieve the Holy Spirit. Forgiving isn’t about accepting, condoning, or even forgetting the hurtful actions of others. It is about responding to those who hurt differently than they deserve. Not forgiving opens up a space for Satan to squeeze in and take up residence. It grows a bitter root in our hearts that chokes out our ability to pour grace in any other area of our lives. I recently heard a quote ~ “Forgiveness is unlocking the door to set someone free and realizing you were the prisoner” – Lewis B. Smedes. It’s true — forgiveness, given freely as it was given to us by God, frees and blesses us in even greater measures than it does the one forgiven. Don’t wait any longer — claim your freedom. Even in my many weaknesses, I so greatly desire to be a Christ-follower that grows into an instinctive grace-giver. I bet you do too. 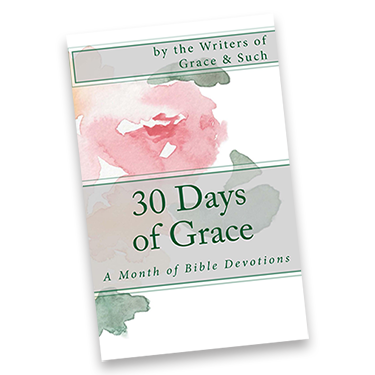 What areas of grace do YOU need to practice so that it becomes instinct? I’m praying that you will start today! Penny is an imperfect ‘older woman’ given abundant grace by a perfect God. She is the co-founder of Empowering for Mission; a life coaching and spiritual direction ministry for those who seek to fulfill their God-purpose in everyday life. She is a Christian Life Coach and Mentor, a mother of 6, a grandmother of 10 (#11 coming soon) and a Gold Star Mom. She presently serves ‘on mission’ with her husband in Singapore where he directs the Sunset International Bible Institute. I never thought of grace becoming instinct, Penny, but it makes sense. When we practice anything repeatedly we automatize at least parts of it into our brains. Great practical tips on how to to just that! Lovely post. Thanks, Penny, for the reminder of how grace can be reflected in so many ways in our lives. I so enjoyed reading this I believe most of us TRY to be graceful, but it’s nice to get a new perspective and new ideas. Thank you so much. Thank you, Diane, I pray that these reminders will help us all reflect grace every day. Thank you, Karen — I pray that as we are trying to show grace each day, these ideas will help us practice until it becomes instinct. I love this one & thank you for sharing this insight & the examples of ways to implement in our daily lives!! Have a blessed Monday!! This post is such an encouragement to me. The thought that grace might become second nature to me. Love these ideas for making grace part of our makeup – thanks for these wise words!